What a cute magnet this is with a shiney red heart and a flocked teddy bear. These teddy bear is sending the message that you are loved. 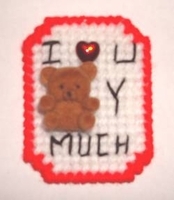 This is perfect for Valentine's Day, Birthday Day, for the teddy bear collector or anytime you want to tell that special someone that you love them. If you have a loved one that is far away this plastic canvas magnet is a perfect way to remind them that you love them and are thinking of them. Send this message to someone you love.